Combing the World's Cuisines for the Best Gluten Free Recipes. The Gluten Free Nomad brings you the latest additions to the treasury of Traditional Foods from Around the World that are Gluten Free, as well as information and stories from readers like you. If you like this e-zine, feel free to forward it to your friends. Welcome to the second issue of The Gluten Free Nomad, where you'll learn what's new at Gluten-Free-Around-The-World.com. If the links below don't work, copy and paste them into your browser. What's new at Gluten Free Around The World? 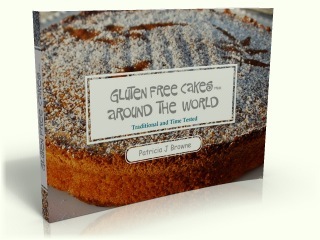 #1) I've just released my eBook of Gluten Free Cakes From Around The World and it's now available for download. This is a collection of fabulous traditional cake recipes I've been gathering over 25 years of exploring gluten free options. It's the book I wish I had all along, especially when I began the challenge of switching to gluten free living. There are over 50 recipes including both dairy and non-dairy toppings and fillings. And cake recipes of all kinds: flourless, grain free cakes like the famous Sachertorte from Germany, and cakes with grains like lemon polenta cake from Italy. Almond flour recipes and nut-free recipes. Chocolate, orange, lemon, almond, cinnamon: many mouth-watering flavors, many traditions. Don't let this one slip by. You can learn more and order here. Because it's an eBook, you can download it and make your first cake before you would've had time to go to the bookstore and back. I recommend the easy lemon almond cake if you want a quick fix. It's wonderful. You can make it orange or almond flavored, or substitute your favorite flavoring. The important thing is it's easy and quick. But there are also more elaborate recipes for special occasions, and an addictive and versatile nut topping/filling that you don't want to miss if you are also dairy or casein free. #2) There's a new page where you can bookmark to get the latest articles on gluten sensitivity, the gluten free diet, celiac disease and more. You can click on the various subjects to get the most current news on them. #3) There are some new recipes over at the Recipe Exchange. I hope you will stop by and check it out. If you get a chance, please share your favorite traditional recipe. Maybe something handed down from your grandmother? Or a discovery you made while traveling would be great to hear about. The more we exchange, the easier gluten free life will be for all of us. Check out the Recipe Exchange here. How do you get your gluten free pizza fix? Do you make your own, or do you know a restaurant serving gluten free pizza? Have you heard anything in the news about gluten free living you'd like to share? ...and download your free ebook of Easy Gluten Free Recipes.